Chop up one medium yellow onion and sautee, add bell pepper (your choice of color) and soften, then add corn, black beans, and cut up cooked chicken. Heat through. Cut up one block of cream cheese and melt it into the pan. Add one can of green chilis. Turn off heat. Fill 8 large burrito tortillas and fold. Place them in a casserole dish. 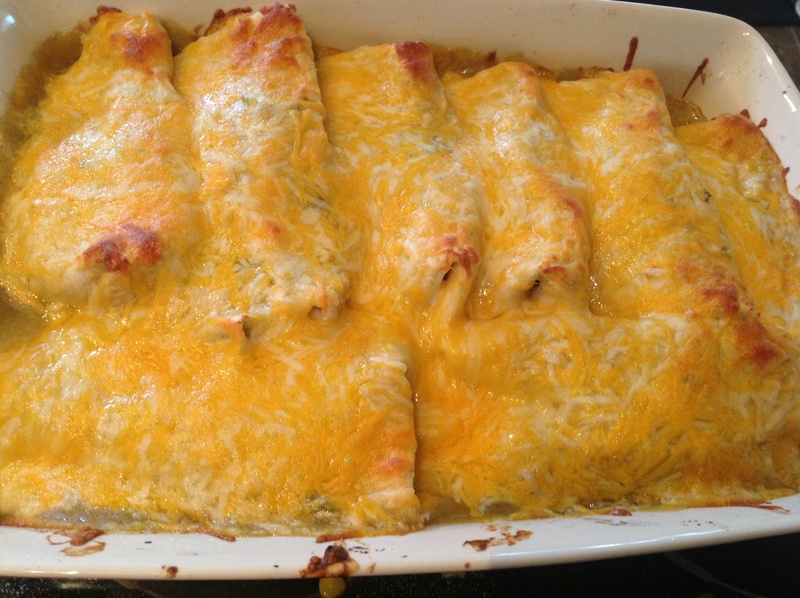 Cover with green enchilada sauce and cheese. Bake for 20-22 minutes until bubbly. Serve with sour cream, guacamole, and other condiments. Enjoy! This is a family favorite and you can add whatever veggies you want. Try adding rice, or instead of black beans use pinto or kidney. Make vegetarian burritos for an excellent meatless Friday dish.